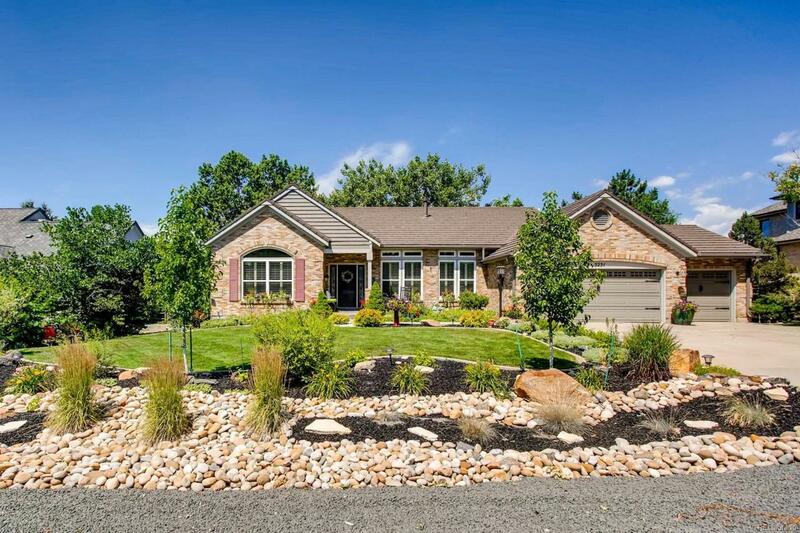 GORGEOUS custom walk-out ranch, one of a kind; backs up to horse property, trails, close to foothills. STUNNING master bath, newly remodeled. Built-in cabinets in family room, plantation shutters on main level, CUSTOM crown molding, recessed lighting, new steel roof ,newer furnace, newer air-conditioner, new windows on main floor, remodeled oversized laundry room/mud room, new stainless steel kitchen appliances, trash compactor, updated kitchen cabinets, kitchen granite countertop/backsplash, convection oven with warming drawer, newer paint on main level, speakers in kitchen, family-room, living rm and outdoor upper deck area; BEAUTIFUL newly finished basement with a sit-up bar, trek deck on upper deck, stamped concrete sidewalk out front and entrance; new leaf-guard gutters, covered 10x10 metal gazebo on upper deck, new garage doors, gas line hook-up on upper deck, new radon system, TV/TV mount in family room. Seller to include a Craftsman rider mower with all attachments. Offered by The Old Country Real Estate Group Llc.